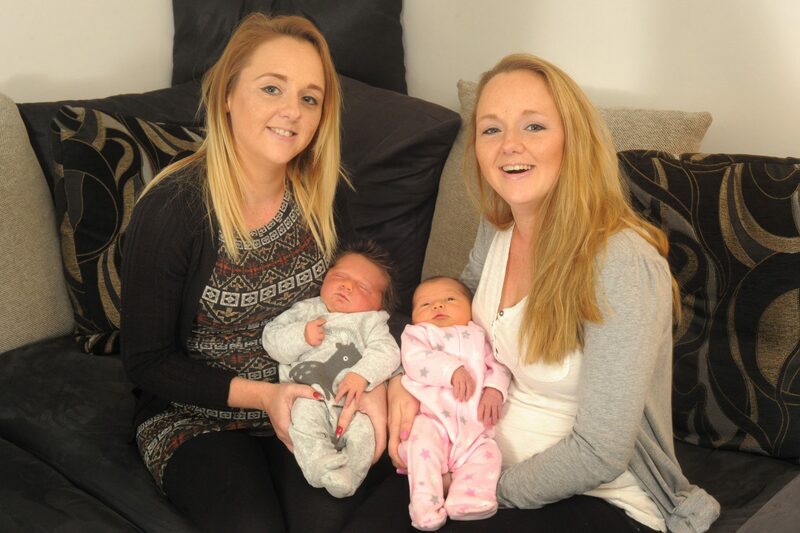 Twin sisters gave birth within 24 hours of each other – on Christmas Eve and Christmas Day. Lucky Ashleigh Davidson and Kelly Ackrill, both 28, found out they were pregnant within three days of each other, but were initially given due dates a week apart for January 2017. But after Kelly went into early labour on Christmas Eve, Ashleigh followed suit on Christmas Day and the sisters have now both delivered happy, healthy babies. “I had a few problems in the morning – I had a bit of a bleed,” said Kelly. “I went into hospital and they wanted to induce labour, but I was already three centimetres dilated so they stopped. River Hendrix Craig is Kelly’s fourth child – and she’s now proud mum to three boys and a girl. “Two of my babies were premature so I had a feeling River might be early,” Kelly said, who gave birth almost two weeks earlier than planned this time. During her labour Kelly was keeping sister Ashleigh informed and sent a photo of baby River to her when he was delivered. “I was already having contractions by the time I got the photo,” said Ashleigh. By midday on Christmas Day Ashleigh was heading to Derriford with husband Tim Davidson and by 4pm she had given birth to baby girl Louella Rose Davidson. “Louella means famous elf,” said Ashleigh who gave birth a week early. The twins, both 28, had guessed they might go into labour at he same time. “We were really excited when we found out we were both pregnant,” Kelly said. Left: Aaron Craig and Kelly Ackrill with River and Right: Tim Davidson and Ashleigh Davidson with Lovella. The sisters, who are also both hairdressers, even ended up in the same room during their birth. “Tim came around to show us a video of the birth and we couldn’t believe it,” said Kelly. “It’s unbelievable,” added Tim, 26.